OGDEN CANYON — A longtime local ski bum has transformed the bar at Gray Cliff Lodge into a small museum that offers a glimpse into the history and evolution of skiing. These days, visitors will see the walls lined with skis arranged in chronological order, from wooden skis more than 100 years old at the south end of the bar to modern shape skis at the north end. Posted above the skis and all around the room are covers and articles from old ski magazines, posters of past Olympic athletes, articles about Utah ski icons, and other memorabilia that collectively offer a ski trip down memory lane. 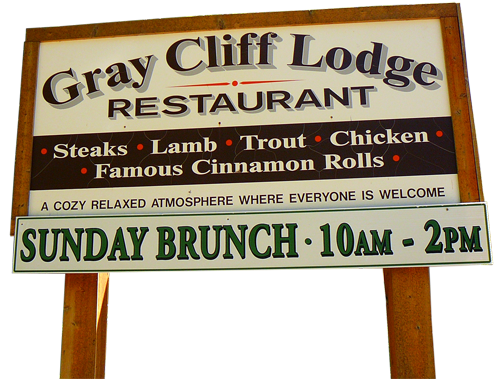 Nick Breeze, who owns an extensive collection of skis made over the past century and lives in the canyon near the restaurant, provided most of the items after sharing the idea with Gray Cliff owners Steve and Jody Sniggs. Some items are from Snowbasin and Sun Valley resorts. The collection started taking shape last winter, and Breeze said it’s still a work in progress. Jody Sniggs said the display has been especially popular with tourists, and wants locals to know about it as well. Visitors don’t have to be restaurant customers to see it, she said. Much of Breeze’s collection comes from his 20 years working for Rossignol at the Freeport Center in Clearfield. That job, along with his own passion for skiing, helped connect him with the ski community. He would trade equipment with other skiers and collect gear through demos, and the gear gradually piled up. “At this point, people offer me skis,” he said. The display features brands that still thrive today, such as Rossignol and Head, as well as skis from defunct American brands like Grosvald, Strand, Lund and Northland. It also has a distinctly local flavor, featuring skis made in Ogden from other brands that no longer exist, including Evolution and Stoneside. The collection offers numerous snapshots of ski history. One is The Ski, a short ski that ends just a few inches behind the binding, invented by Sun Valley’s Bob Burns in the 1970s. Another takes visitors back to the origins of American skiing, with long, wooden skis that Breeze said could date to the late 1800s. Gold miners in California’s Sierra Nevada mountains made them by hand and used them to get around between mining camps. Articles and posters tell visitors about local ski icons like longtime National Ski Patrol member Ralph Johnston and Snowbasin ski school patriarch Earl Miller. They also highlight big events in local skiing history, such as the 1947 U.S. Nationals at Snowbasin, which was likely the most high-profile competition held there until the 2002 Winter Olympics. Breeze said his ski collection is an ongoing labor of love that he will keep pursuing indefinitely. “I’d like to have one of every ski ever made,” he said.